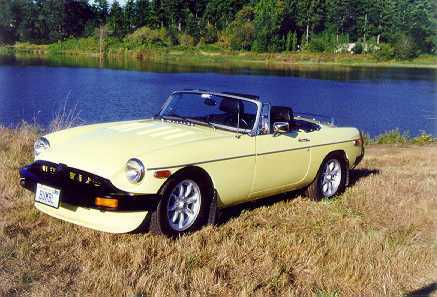 General: 1977 MGB, 90k at conversion, chartreuse exterior base/clear, with stock black vinyl interior. I'm the third owner and I've owned the car for about 10 years. 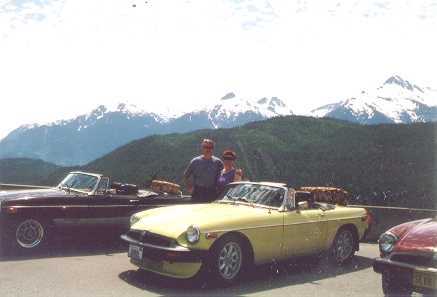 Before doing the conversion to a V8 I spent about 8 months researching what others had done. The V8 newsletter was an absolutely indispensable starting point for my research. After deciding on my conversion approach I spent another 8 months acquiring my parts and building the motor. The actual conversion from the 4-banger to the V8 only took about two weeks. I did all the mechanical things first(suspension, brakes, drivetrain) and worked out all the bugs. Then I completely disassembled the car and had at it: Soda-blasted to bare metal; Dog-legs replaced; Parking-lot dings removed; Bonnet louvered; Repainted in base coat clear. 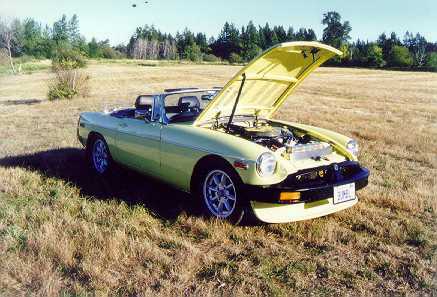 Then of course I had to reassemble the car which I did in record-time (18 intense days) for this driving season. I've got about 5-6k trouble-free and very enjoyable miles on the car since finishing. I'm very happy with the car the only things I'm considering changing are the use of a narrowed Ford rear-end with limited-slip and a better ratio, say 3.7:1 or 3.5:1. Some kind of traction device to eliminate wheel-hop, and possibly a Super-Trap instead of the muffler. I saw a car up in Canada at the MAMGBR meet that had one. I like the idea of being able to tune the exhaust system by simply adding or removing disks from the Super-Trap. 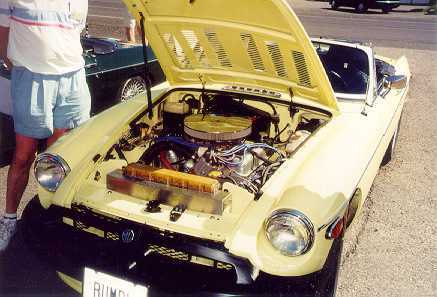 Engine: 1963 Buick Skylark 215 with 4-barrel heads. Rescued from chicken coop for $50. Modifications: stock crank turned 10 under, rods sized & shot peened, line bored, cam bearings replaced, cylinders bored 30 over, SilvoLite pistons estimated CR 9.5:1, block decked, heads milled, minor relief of exhaust ports, new valves & guides, new rocker assemblies, adjustable push rods, 3 angle valve job, matched Kenne Bell cam/lifter/dual spring cam(mild), dual roller timing chain, high volume oil pump, D&D Fabrications swivel oil filter mount and gear reduction starter, Buick 215 intake manifold, Carter 400cfm carburetor, Pertronix ignition in stock distributor. All ARP bolts. Balanced. Block, heads, intake manifold, distributor, bell housing, and all ancillaries powder coated in clear or light gray. Cooling: custom 3 row 12 fin per inch core, custom top and bottom tanks, increased length by 3", stock MGB electric fans, oil cooler. Transmission: Borg Warner world class T-5, 0.63 final drive from 88 Firebird. Bellhousing/Clutch: clutch/pressure plate, McLeod hydraulic throw-out bearing. 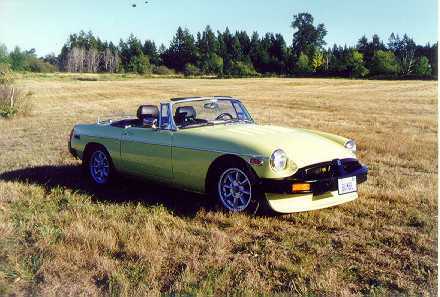 Rear End: stock MGB 3.9:1. Brakes: converted to silicone, new master & wheel cylinders, stock booster. 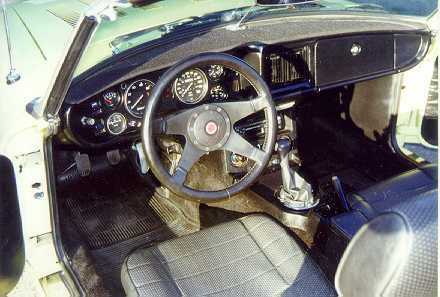 Front brakes: Stock MGB, Mintex pads. 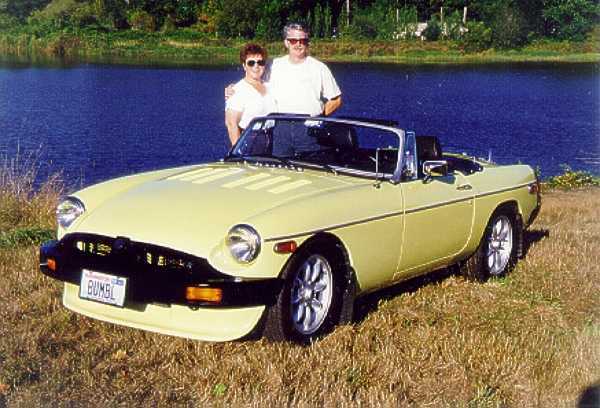 Rear brakes: Stock MGB. Front Suspension: all components rebuilt/replaced, stock sway bar, 1 inch lower springs, control arms reversed. Rear Suspension: all components rebuilt/replaced, stock sway bar, lowering blocks. Wheels/Tires: 15x5.5 Minilite replicas, Yokohama AVS 195x60. Exhaust: RV8 style headers from TSI, ceramic coated inside & out. 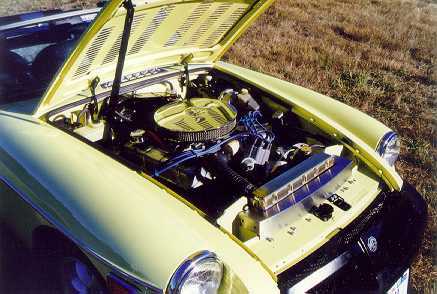 Custom 2.25 inch system with cross-over to single high-flow muffler. 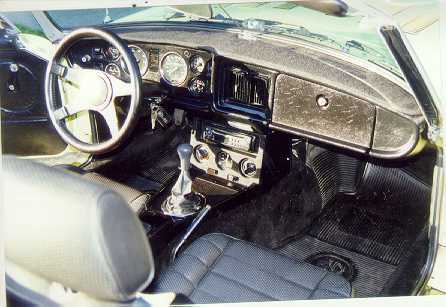 Instruments: stock speedo, recalibrated tach, VDO oil pressure(mechanical), volt meter, temperature(mechanical), and clock. Special Features: Louvered bonnet. Lots of powder coating. Sources: Dan Lagrou at D&D Fabrications, the internet, The MG V-8 Newsletter. Recommendations: Don't bother with block hugger headers. Use a T5 transmission. Make use of all the knowledge on the internet. What Would You Do Different: Not much. I'm very happy with things. I have a '69 GT that I am going to put a fuel injected 215/Rover into. Also may use a Supertrap instead of a muffler, this would allow for further tuning of the exhaust system. Estimated Cost: Unable to reveal. Wife might read the article.